As we all endure these cold temperatures, it can be easy to forget that some of the stuff we carry with us is isn’t quite as hearty. Notably, electronics can be damaged quite easily and seriously in this weather. It’s not the cold itself that is always a problem (although it can be), but instead it’s the temperature change from cold to warm which triggers condensation inside the device. 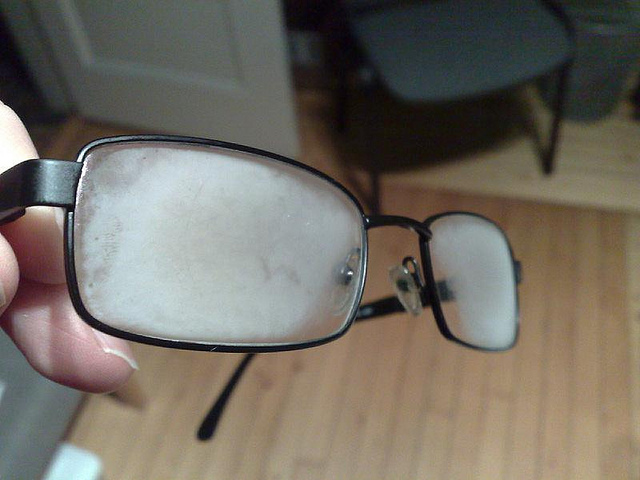 That fogging of your glasses when you come in from outside is water condensing onto the cold glass surfaces. This same thing takes place unseen inside your phones, tablets, laptops, cameras, and other electronics. Because we all know that water and electronics do not play well together, this puts your data as well as the device itself at risk. We would never try and use our device after it had fallen into water, but just coming in from the outside can result in enough water inside the device to cause the same damage. 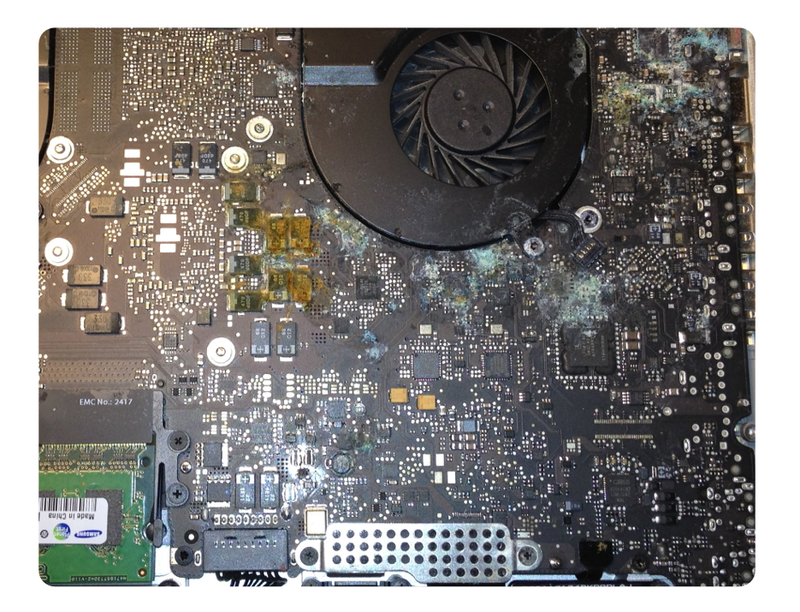 To the right you’ll see the result of actual water damage inside a MacBook… an extremely expensive repair (click the photo for a better view). Condensation/water isn’t the only killer here. Cold batteries will die faster, cold hard drives can have trouble spinning and can damage your valuable data, cold LCD displays won’t look or function right, and the sudden change from cold to hot as internal components heat up when powered on can cause permanent damage. While too much heat can hurt electronics, too much cold has plenty of negative effects as well. If at all possible, don’t let your electronic devices get cold in the first place. This means not leaving them outside, or in your car. If you have to carry your electronics for an extended distance from one building to another, bundle them up inside a bag as well as you can to insulate them from the cold. Wrapping them in a towel, shirt or blanket isn’t unreasonable given the bitter cold temperatures lately. If it’s too late and your electronic device has already gotten cold, don’t turn it on. If possible, remove the battery since these days “off” isn’t really powered off. If you’ve gotten lucky and condensation hasn’t damaged it yet, the moment of powering it up and sending electricity through the entire device is the most likely moment of death. The safest thing to do is let it sit in a dry, room-temperature environment as long as you possibly can. Just because it has reached room temperature and is dry outside does not mean there has been time for all the condensation to evaporate inside. This can take hours. Obviously, prevention is more convenient and a much better option. Stay warm and safe computing! This entry was posted in Helpdesk Alerts, ITS, LIS Staff Interest, Middlebury Community Interest, middpoints, Post for MiddNotes, Post for MiddPoints on February 16, 2015 by Scott Remick.